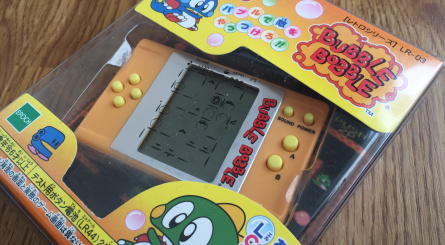 Nintendo first hit the LCD game scene all the way back in 1980 with Ball, a simple but thoroughly playable affair at the time that may be familiar to fans of the Game Boy Camera or those brave souls who ventured onto the DSi shop. From these humble beginnings Nintendo's LCD empire spawned a myriad of licensed and original variants coming in all shapes and sizes - dual screen, colour, two player games with individually wired miniature joypads - whatever you can dream up; Nintendo did it, and they did it well. It's really no accident that these titles are still sought after collector's items worldwide over thirty years after the series' launched thanks to their combination of quality gaming and sensible-justification-of-purchase clock/alarm functionality. But just as Sega, Atari, SNK, NEC and others tried to compete with Nintendo's wildly successful Game Boy range, the Game & Watch line also faced notable competition both at home and abroad. Let's start with what is probably the most obvious to gamers of a certain age - Tiger Electronics massive range of tie-in titles that covered the hottest IPs of the eighties and nineties, from Altered Beast and Castlevania II to Street Fighter II and Golden Axe. These titles were bold and beautiful to look at, either in the pages of mum's Argos catalogue or held within a tantalising display case in your local branch of Dixons, but if we're honest they couldn't hold a candle to Nintendo's offerings as games. Sure they had the right artwork around the edges and the characters were generally recognisable, but they were rarely the sort of thing anyone would choose to play. As time went on and LCD games struggled to justify their existence in an increasingly affordable Game Boy Color world the company had to go to greater lengths to capture gamers attention and wallets, creating miniature light guns for their Virtua Cop LCD game or trying to fit 32-bit classics such as Symphony of the Night, Daytona USA and Virtua Fighter into a one-colour fixed screen device. Thankfully these disgraceful attempts didn't fool anybody, and Tiger's LCD range faded into obscurity without anybody noticing or caring. But while Tiger's offerings may arguably be the most familiar of all the "Hey wasn't that a game on something else already?" LCD publishers to us Westerners Japan has been quietly producing quality licensed titles for decades, and while demand has naturally diminished it's still a successful enough niche to allow for some to be sold new on various online outlets. 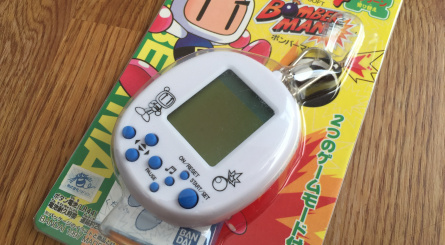 Japan's older titles go just as far back as the Game & Watch line and naturally reflect popular licenses of the time - Mobile Suit Gundam and Space Adventure Cobra to give some examples on the anime side of things, and games such as Pac Man and Dragon Spirit bringing some gaming representation to LCD handhelds. 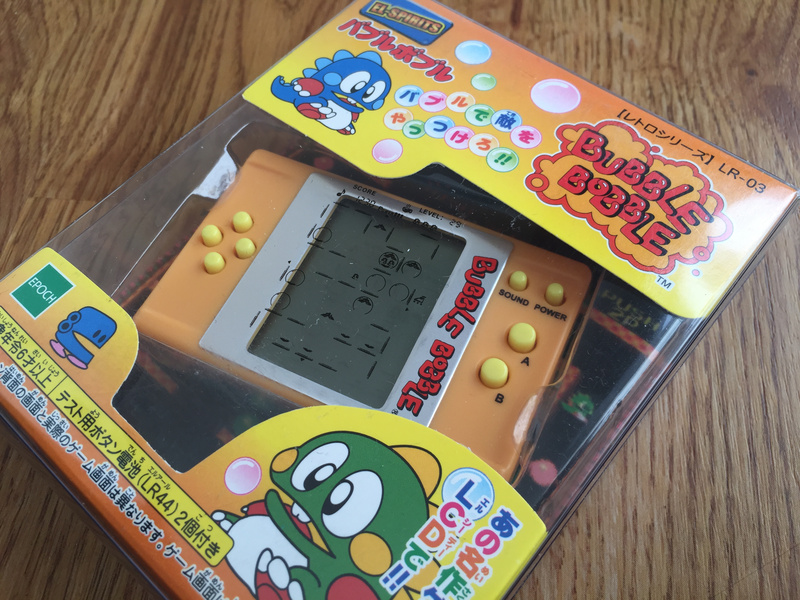 But while LCD gaming may be from the past it didn't stay there, undergoing something of a retro-revival in this area in the past decade that has allowed for high quality "ports" of titles such as Fantasy Zone, Puyo Puyo, Beatmania and more to grace LCD games roughly the size of a large key fob or Dreamcast VMU. Technology has naturally moved on in the decades since LCD games first kept young thumbs busy on a Sunday afternoon, meaning these modern takes on the classic style are generally smaller with more detailed screens and sound (even including real speech on the odd occasion!) and while of course a little leeway is still needed, they produce a more faithful rendition of the games they're trying to imitate than their older counterparts. The "gimmicks" of those last-gasp Tiger days still surfaced from time-to-time with some games sporting unique controls (Beatmania's turntable, to give just one example), rumble packs, or headphone sockets, but they're generally more thoughtfully integrated than they were on the older games kids used to smuggle into the playground in the eighties. Nintendo's Game & Watch line absolutely deserves the near-legendary status it has attained since Gunpei Yokoi first saw a bored man playing with an LCD calculator on the train, but there's actually a wealth of quality games out there from the likes of Capcom, Konami, Sega and Taito that also deserve to be celebrated too, and the first step is knowing that we've been missing out in the first place. 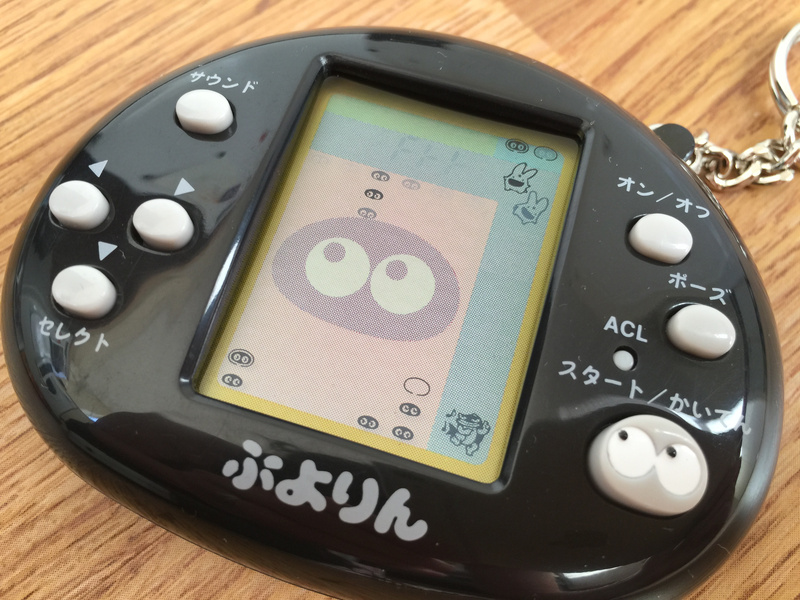 If you'd like to know more about some specific LCD titles, Kerry's started covering the games shown in the photos above on her personal blog, Shinju Forest. Whenever I think of Tiger, Aladdin immediately springs to mind. I was a little too young around the time the original Game Boy rolled around, but I do remember such fond memories of my Game Boy Advance, and my first DS. Oh that beautiful, chunky thing... I still go back and play my old GBA titles on the Wii U using VBA GX just to relive the memories. 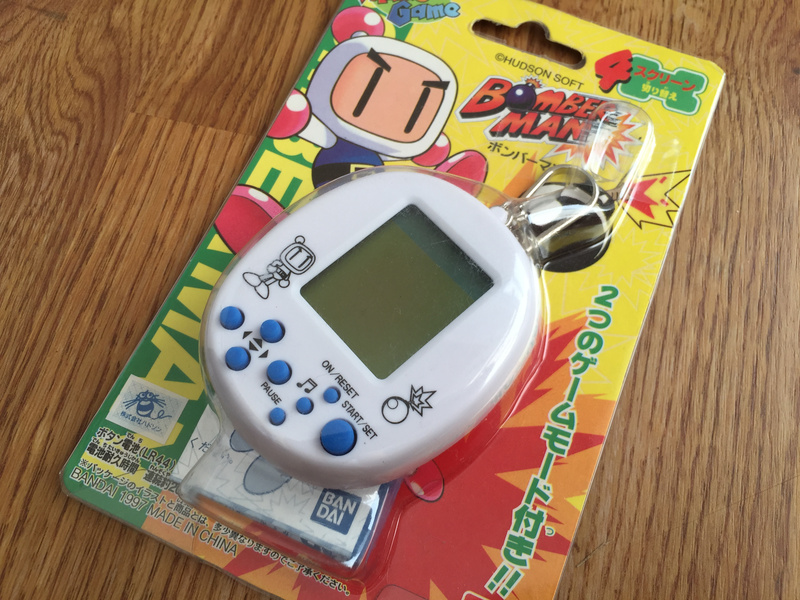 Also, can we just take a moment to appreciate the badarsery and genius of Gunpei Yokoi? I loved these as a kid, I've still got all of my Game & Watches, the highlights being mint-in-box copies of Zelda, Super Mario Bros Crystal Screen and Mario the Juggler. I remember wishing Nintendo would do a version of the Game & Watch where you could just swap out the screens so it would be cheaper to get new games, not long after that I basically got my wish when the GameBoy was released! I enjoyed my share of LCD games as I couldn't afford a Game Boy back in the day. There was a Simpsons cupcake catching game, and three Tiger Electronics games (one based on a now obscure movie called PageMaster, 101 Dalmatians and a Sonic Pinball game). When I was a baby, I had an LCD game that, when I lose, would spawn a soulless-looking bull sprite and would play this incredibly creepy chip tune version of Für Elise that made me throw the toy across the room in horror. I was scared to even walk past the thing. I had no shortage of Virtual Pets though, however, the quality varied wildly between them. 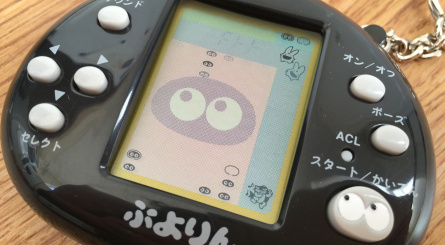 One of my favourites was a "Family" virtual pet which allows for up to four family members (you start off as a newlywed couple) but it was so buggy that the toy malfunctioned after a day or two. I exchanged it but encountered the same problems. The next best virtual pet was my Chinese Panda, which my mum used to babysit while I was at school. Good times. I loved the Digimon virtual pets as well. I had an LCD Donkey Kong game, revolutionary at the time. Oh and a Major Morgan that blew my socks off. But then, I remember playing Pong and only having 3 TV channels, so by today's standards I was easily awed. That kind of stuff was all I had as a kid. But not the original products, but soviet rip offs of these games (they were pretty much identical though, as I've found out later). My main recollection of LCD games were the sonic the hedgehog ones that came with McDonald's happy meals. And my grandparents had one of those 100 in 1 games but I think most of them were variants of Tetris. This is an incredibly interesting article. 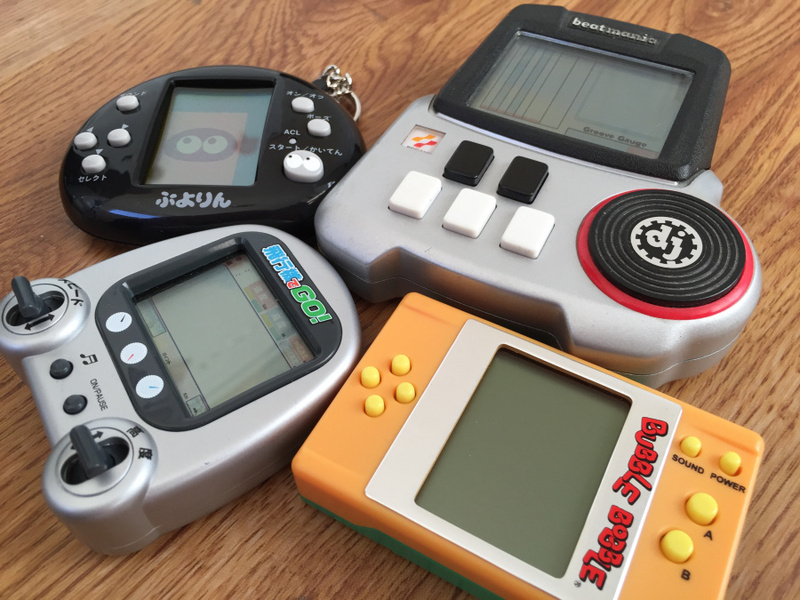 The history of LCD-games is often treated like it's worthless but it's not. There is a book on the Nintendo Game & Watch line, and Kerry - I think you should write a proper book about the non-G&W material you can find, because this is history that will eventually get lost because emulation can't preserve it. As games with extremely simple functions are getting more and more popular (mobile phones etc), it's great to see the great deal of creativity that went into these games and how they basically helped in shaping the industry as it is now. And look at them - they are ADORABLE. I'd kill babies for that Bubble Bobble thing!! It looks like a mini Orange amp - it's just irresistible. The only LCD games I've ever gotten were the G&Ws. My parents got me DKII when I sick while on vacation, to cheer me up. I also had Octopus and several others. I find it sad that the people of today dismiss LCD games are 'dated,' 'primitive' and 'who wants to play those?' I much prefer the classic versions of G&W games to the updated modern ones found in the G&W Gallery collections. People should give these classic games the respect they deserve. G&W were by far the best portables pre-Gameboy but I always had a soft spot for the Tiger units because they picked up cooler game titles (and used cheaper AA batteries). Does anyone remember the mind numbing music from the LCD Sonic the Hedgehog by Tiger Electronics? More than 20 year later it is still seared into my mind. I had dozens of LCD games. Most were lame but some were brilliant given their limitations. BEST EVER was an unknown game called Air Fighter. That game is brilliant and I still play it to this day. I remember all to well messing with a calculator to pass the time. But that was generally in class. I think I remember getting LCD games in happy meals when I was younger, but I'm not entirely sure if I'm right on this. Still, interesting read. I recently started collecting LCD handhelds and Keychain games. It gives me something else to dig for at swap meets, thrift shops, and yard sales. Most people usually sell 3-5 games for $1-$2. My keychain games I've paid more for, Gamestop carried three Nintendo Mini Classics last year. Another company called Hiro made 6 games that all seem decent including Space Invaders, Tetris Jr, Tetris Jr 2. They also made these two which could be considered the Game & Watch's half siblings. This is a nice coincidence, as I recent discovered my GB Micro in a drawer, ordered a USB charger for it and have spent much of the last week playing Game & Watch Gallery Advance. Have never played or even seen a single Tiger Electronics LCD game in real life - they must have been a US phenomenon. Much or all of our LCDs were acquired during family holidays in the Mediterranean islands, and they were all G&W, except one which I forget the name of but involved trying to avoid cars on a multi-lane highway. Favourites of mine are Donkey Kong Jr, Legend of Zelda and Mario Bros. And not just in a 'good considering the limitations' way - they are actually great games in their own right. Some of the GBA remakes were great too - I particularly adore Chef and Rain Shower. A new 3DS edition of G&W Gallery would be very much appreciated, Nintendo! Oh, and why didn't we ever get Game & Watch Collection 2 (combining Parachute and Octopus into one game) from Club Nintendo in the UK? I have the first one, but not the second. I had so many of these as a kid: the basic race car and soccer ones and fancier ones like Double Dragon and Marble Madness. Got rid of them the day I got my Game Boy, but some of them were pretty fun. I had one called submarine where you avoid getting shot by torpedoes. I once had a Donkey Kong 2 game and watch game........until it got broke. Funny thing is that my bro was the one that played the heck out of it and according to him, I broke it. Wonder how to get that game to pay my respects to it? 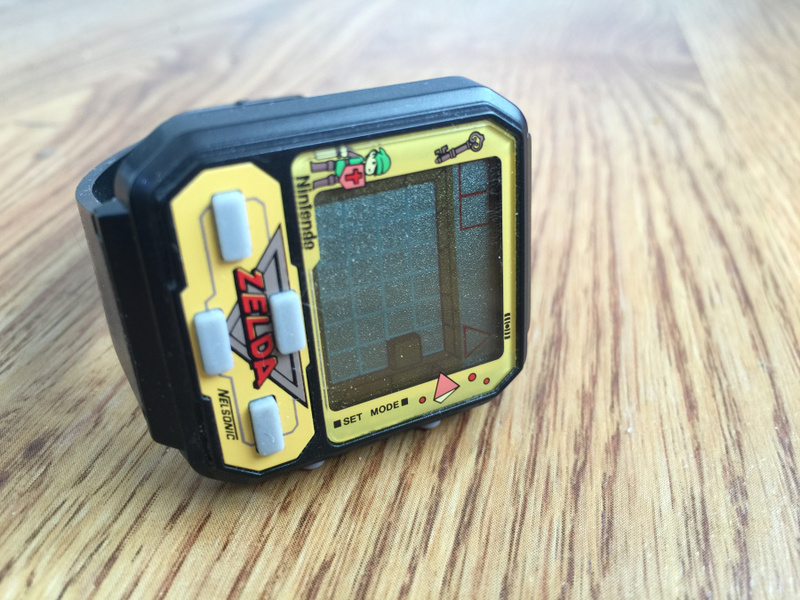 I'm shocked that after GBA and DS, Nintendo hasn't given a comeback for the game and watch series. I played the crap out of the Virtua Fighter Tiger handheld. 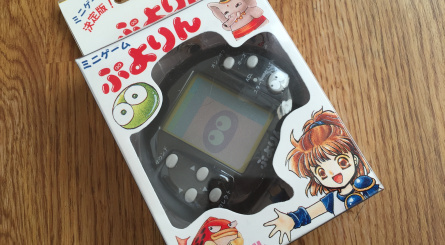 The Puyo Puyo handheld pictured was released in the US by Tiger under the name Puyolin. It looks very similar, but it's blue instead of black with the text on it in English. I have the US version. It's decent, but not that great. Puyo Puyo is much more fun as a vs. game. 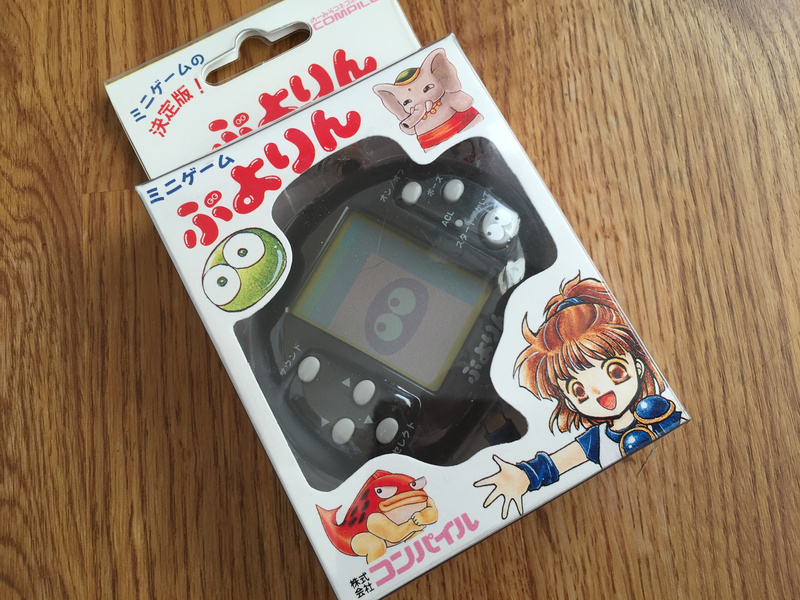 Edit: Telling from a hiragana-romaji converter, the text on that Puyo handheld actually says "Puyorin".